I am especially delighted that my contributions this month include taking the fashion photos for Dominique’s post over at 3C Style. We both hope this will happen again as our friendship and shared creativity made it not only fun but produced results we are both delighted with. This was something of a shock as I rarely take pictures of people and it was one of those rare and magical occasions when everything just worked. Later this week I will share some behind-the-scenes photos and stories! On a slightly different note – if someone had told me a year ago that I would find myself out in my garden taking pictures of myself wearing a masquerade mask and feather boa I would have never believed them. I kind of like the Gothic look personally. 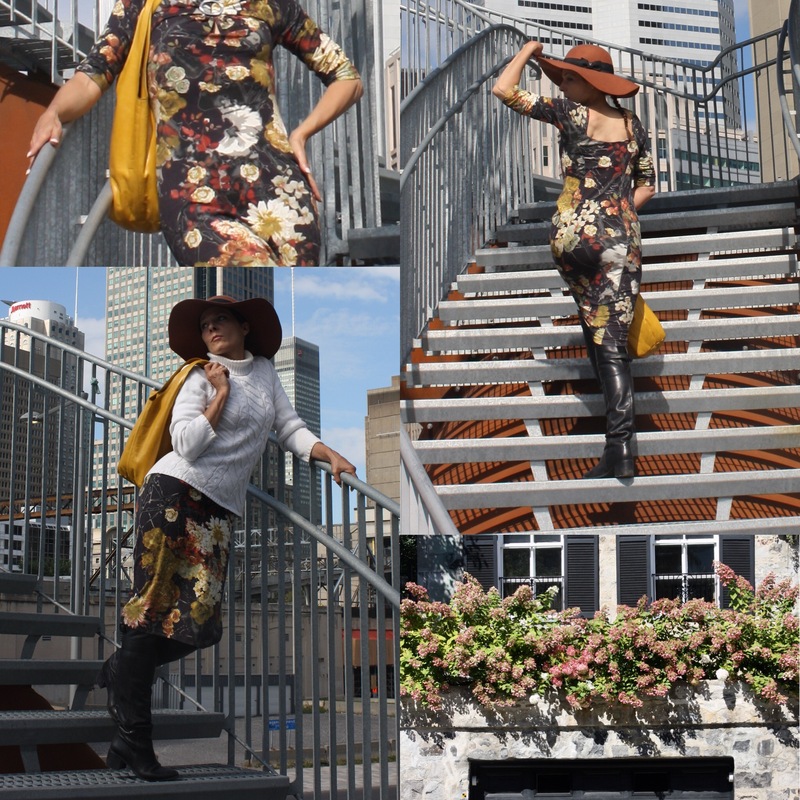 Fashion Inspiration by 3C Style, 3C Style Photography by Darren, Flower photography by Darren, collage compiled by Roda. The ‘Siberian Bugloss’ is one of my favourite plants for a shady, moist spot in the garden. The gorgeous forget-me-not flowers are not even the main attraction on their own as the foliage is very attractive too. I am less keen on the variegated forms (top picture). The bottom picture shows the cultivar ‘Jack Frost’ which has almost silvery leaves and makes it shine out. We grow it beneath our apple trees along a north-facing fence. It seems virtually pest-free which is an added bonus. The Pulmonarias next to it suffered badly from mildew in our dry summer this year but the closely-related Brunnera were almost unaffected. Halloween black cat. DO NOT TELL SUSAN I have been fraternising with felines! As hinted by the name, this species is native to San Luis Obispo county in California USA. It is a bulb, closely related to lillies. Winter growing, it flowers in late spring before dying back to a bulb during the hot summer before sprouting again in the cool moist winter. A fairly coastal species it benefits from protection from frost (and summer moisture) by being grown in a pot in a cool greenhouse. I find it fairly easy once past a year old, and have kept it going from seed from a Jim Archibald collection around 20 years ago. It seems to be self-fertile and hand-pollination will produce seed. This is easy to germinate but less easy to grow to maturity. Confession time. I don’t like hydrangeas. The old fashioned mop-headed ones (Hydrangea macrophylla) especially. They come into growth too early here and get caught by late frosts and look tatty . Plus the artificial looking colours are not to my taste. They are, however, easy going plants, good for poor soils or seaside gardens. In the right place I can tolerate them. We saw some in Montreal that were used carefully and looked rather nice. I also like some of the white, greenish flowered ones such as H. arborescens or H. paniculata (probably the species pictured here). H. quercifolia has very attractive foliage and autumn colour. The above images were taken in Montreal. The two below are of Hydrangea arborescens with autumn colour at the Explorers Garden in Pitlochry, Scotland, this past weekend. Next Another guest in Jest…. Your costume is fab, I’m very envious. I love those greens white hydrangeas but detest the lurid pink and blue ones. They always remind me of old people’s homes somehow. This post is so lovely, informative and funny. Oh my, it would had been such a great prank. I’m laughing just picturing you. If only I had thought of it! You make a ravishing crow. I wish I could have disguised myself as a fox. Thank you Lisa. It was amazing and liberating for me to take those photos. Very happy memories😄. If I am talented, thank you, then it is thanks to the encouragement of other talented friends like you that has allowed me to blossom Lisa. You are always a foxy lady to me Dominique😉😀😍. You all dressed up, except for me! This is actually funny as I’m the fashion blogger. Ironic. Love this edition too! You only have to ask. Anyway – by then you Canadians will all be eating cannabis muffins! I’m all for neighbor shock value. Yes, a perfect LBD, green hair, with matching jewels. I am VERY tempted to fly an EU flag as well, knowing all our neighbours voted to leave the EU…. It will happen Lisa – of that I am sure. Love and hugs to you too! The crow costume looks even better in full view! I don’t know if this could work with a different model. Dominique and I had a unique rapport which still amazes me a month later. I now have a henna tattoo as well. Those pesky neighbours are going to hate me! The wings, sadly, are added digitally. I wish I could get some real ones that good! Don’t worry. I haven’t revealed that I am actually a 13 year old girl called Tracey and the rest is photoshopped too. Thank you. If all the Brexiters left my neighbourhood it would be very quiet. Sounds a plan! Thank you Sarah😍. You are so kind! Dominique is easy to take great pictures of and the choice of locations and poses is hers too. It was so much fun. What a great composition and you look great as a dark angel. A powerful force to be reckoned with in juxtaposition with those delicate blooms. Works for me.